Lee Labrada is a bodybuilding hall-of-famer and nothing less than a legend. As the head of Labrada Nutrition, he's here to help you get in better shape than ever. Leonardo da Vinci created a drawing of the Vitruvian Man (circa 1487) which supposedly depicts ideal human proportions. Muscular balance and distal proportions of this man fit perfectly inside a square and a perfect circle. The drawing blends art, aesthetics and science to design the ultimate man. Fast forward 500 years. A changed world has evolved its view of science, art and aesthetics. It now searches for the ultimate man through bodybuilding competitions. One man stands out on the stage, not because he is the biggest or strongest, but because his body obeys the ancient formula of perfection through balance. Lee Labrada built a championship body and retained his remarkable physical architecture even after he retired from competition. For all he accomplished physically, what Lee accomplished civically at Labrada Nutrition and for the City of Houston, Texas, forced greater, legitimate change to real people in need. On rare occasions a man will invest everything in a goal and actually get it. He rises to the pinnacle of his profession and sets an example normal men only dream of attaining. Even rarer is the man who can step off the pedestal and affect ground-level change on this bulging planet. As the owner of Labrada Nutrition, Lee can give aspiring bodybuilders the inside scoop about supplementation. Follow his approach and you can be stronger than ever. Follow Lee's nutritional plan and stay lean and fit all year round. Forget dieting, endeavor toward nutrition. Lee may be retired, but his training regimen works as hard as ever. Follow this plan and become stronger than you've ever been. Build Your Own Lean Body in 12 Weeks! Follow Lee Labrada's simple but effective Lean Body plan, along with over 40 other full fitness plans, for only $8.99/month! Lee (now 51-years old) was born in Havana, Cuba in 1960, to Spanish parents and Caribbean sun. He grew up in Houston and started lifting weights to get bigger for his high school football season. What began as a simple path, a sports incentive, opened to a superhighway toward bodybuilding supremacy. He was the smallest contestant in his first competition, and he won. From 1982-1995, Labrada won 22 bodybuilding titles. He placed 4th or higher at the Olympia seven consecutive years (a feat matched only by the audacious Arnold). He was runner-up in both 1989 and 1990, but didn't win on the biggest stage, despite flexing one of best moustaches of the '80s. He won Mr. Universe in 1985 and a slew of Grand Prix events, despite still being smaller (5-foot-6, 184 pounds) than most of his competitors. Lee retired in 1995 to pursue an even greater conquest. As a bodybuilder, he encountered troves of supplements and other products, but these were as hard to trust in the past as they are now. Labels and ingredients were vague and often faulty. He wanted an honest label and a pleasant taste … hence, the launch of Labrada Nutrition. Lee Labrada founded the company that bears his name. He is President and CEO of a company that does more than set an example. It can actually take you down the road to recovery, improvement and success. That's what Lee wanted, to help others get what he got, to do it fair and honest. Lee isn't a scientist. He got his degree from the University of Houston in civil engineering. He made his greatest discoveries in the gym, not the lab. When Houston was decried as the "Fattest City in America," Lee spent two years developing and implementing bilingual programs to help Houston shed its rotund reputation. 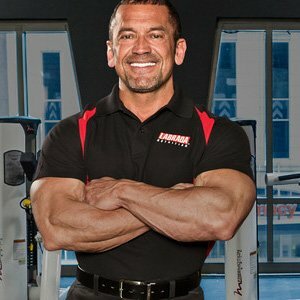 Labrada was elected to the IFBB Pro Bodybuilding Hall of Fame in 2004. He never halted his life-long journey down a path of self improvement. Perhaps he even accelerated that push as he aged. "Bodybuilding is the closest we have to the fountain of youth," Labrada said. For all he did as a bodybuilder, he has done more since he retired. He helped bring legitimacy to an industry in dire need of trustworthy role models. Before the 1989 Olympia, Lee said in an interview that bodybuilding "isn't just the quest for the most massive man. It's a quest for the most perfect man."